A company that once flexed its consumer tech dominance in the 1990s and early 2000s falls on hard times because its legacy strength has become a flat to declining business. The cause: everything rapidly moved from PC to mobile. A new CEO with a record of success at a tech titan takes the helm. This CEO possess software engineering and managerial experience, suggesting that this person can bridge multiple disciplines within the ailing company to guide a turnaround. The troubled company has gone on an acquisition binge and has some very lucrative assets in its portfolio, but unlocking the value of those assets has been a big challenge. Within three years of having started, shareholders and employees lay siege to the CEO. Both groups fault the CEO for the company’s core strategy (or lack thereof). In response, the board begins entertaining major asset sales and more changes to the corner office. Which company have I described? If you think I’m referring to Yahoo and its embattled CEO, Marissa Mayer, you’d be correct. If you recognize this as Nokia and its former CEO, Stephen Elop, you’re correct, too. 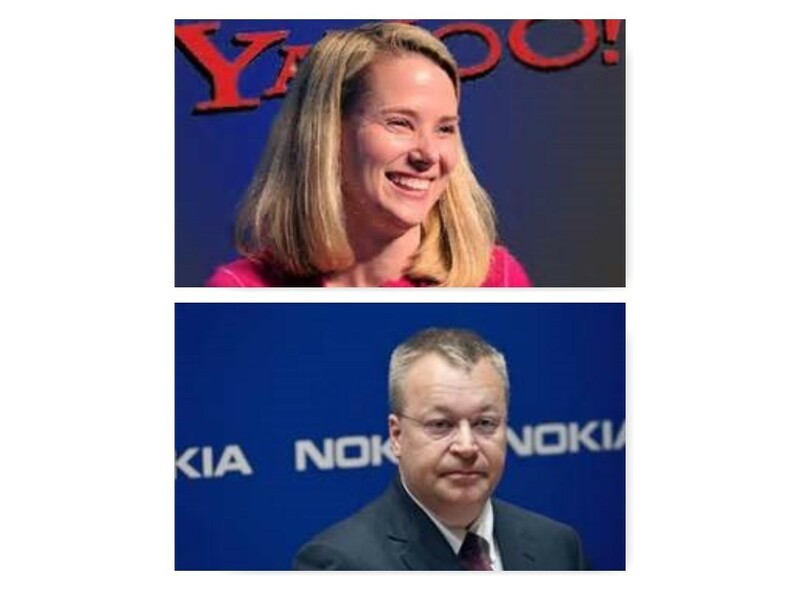 While there are important differences distinguishing these two scenarios, Yahoo is suffering the same turbulence that brought down the once-mighty Nokia. It’s hard not to see an end game for Yahoo that, like Nokia, involves selling its core business. When that happens, it will represent just the latest example of a leader-turned-laggard at the hands of the mobile revolution. For Nokia, that revolution began with the adoption of 3G networks, which gave birth to content-rich marketplaces for consumers, developers, and operators that provide bandwidth. Once a market for data and all that it enabled emerged in the mid-2000s, Nokia arguably was doomed. Competing would have required the capabilities that consumer software giants solely possess. That’s why Apple and Google swallowed Nokia’s market share in a matter of a few years and ultimately forced its board to sell the company to Microsoft. For Yahoo, the rapid move away from PC-based consumption to mobile exposed the company’s absence of a unifying foundation that would attract, monetize and retain mobile users. Google’s Android has five core components that do this: Gmail, Google Maps, YouTube, Google Play, and its search engine. Apple has iTunes and its cousin, the App Store. By comparison, Yahoo has a portfolio of strong franchises that includes Flickr (photo sharing) and Tumblr (blogging), but these still exist as loosely affiliated experiences that each have compelling competitive alternatives. Put simply, what reason does a mobile user have to use Yahoo? Absent a compelling answer, Yahoo has little room to maneuver. One could argue that Nokia’s best move to maximize share owner value would have been to sell itself at the peak of its dominance, around 2006, since absent a software backbone the company was bound to fail. At least Yahoo seems to recognize that it, too, can sell itself while there’s still enough PC-based advertising revenue left. I’d like to be able to say, “If only Nokia or Yahoo had done X, Y or Z, they’d be just fine,” but in this case, I’m not so sure such hypotheses hold water. I suspect that as soon as the mobile migration began, both these once mighty companies days as leaders were numbered. Nokia – the company – is doing JUST FINE. It is a 3g/4g network equipment and services company. It just acquired Alcatel Lucent and now is the second largest Network equipment company in the world (behind Huawei). In the article, you mean the handset division of Nokia, which was sold to Microsoft. The brand is Lumia. Not Nokia. Thanks for commenting. You’re right, of course, that the new Nokia is alive and well. It’s also true that Nokia in the context of this post, mainly from 2011 – 2014, was primarily known for its phone business. It’s in this context that I’ve made the comparison to Yahoo, the validity of which I stand by completely. You are spot on, Matt. Nokia, for a good part of 20+ years was synonymous with mobile phones. In fact, in some markets, Nokia was the Kleenex of Mobile Phones. With the sale of the devices business. the soul was gone. Until, the new Nokia establishes a ‘new soul’, and a brand following like the Nokia devices, it will always be referred to as the bygone era. Nokia now sells to enterprises – telcos specifically. So, in their current business model, they are unlikely to have the mass market brand following that many consumer product companies (e.g. Apple) have. But points are well taken.